Radiocarbon dating works by comparing the three different isotopes of carbon, where an isotope is an element with the same number of protons, but different number of neutrons. So, essentially isotopes of the same element are chemically identical, but of different masses. While the lighter isotopes 12C and 13C are stable, the heaviest isotope 14C (radiocarbon) is radioactive, which means its unstable and decays. Over time 14C, which is naturally occurring and dispersed in the upper atmosphere, decays to nitrogen (14N). Over time 14C decays to nitrogen (14N). Plants soak up the CO2 in the atmosphere through photosynthesis. In doing so, the plants ingest both 12C and 14C atoms. But eventually, animals who eat plants or animals who eat other animals who had eaten the plants also end up ingesting the 14C isotope, including you as a human. 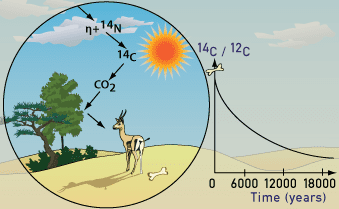 Thus, every plant and animal will have the same amount of 14C compared to 12C as the atmosphere (the 14C:12C ratio). Because it’s not affected by physical (temperature, pressure) or chemical (water content etc.) phenomena, this radioactive decay can be used as a “clock”. We know for instance that in 5,730 half of the 14C in a sample will decay. By comparing the 14C:12C ratio at the time of death of an animal and the ratio today, we can calculate how much time has passed. Artifacts can also be dated this way. Robes, scrolls, books, anything with carbon in it. 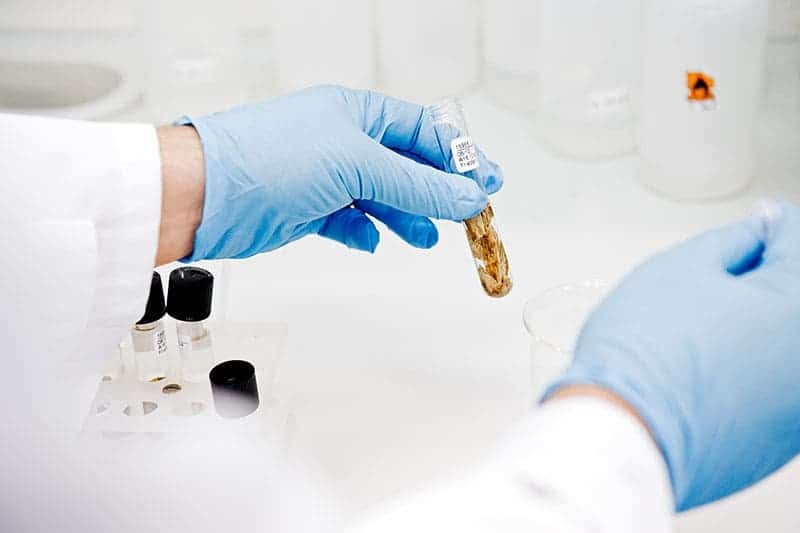 Radiocarbon dating was the first method that allowed archaeologists to place what they found in chronological order without the need for written records or coins. Since it was first demonstrated by Professor Willard Libby in 1949, the scientific community has never looked back. An accelerated dumping of CO2 into the atmosphere, especially since the 1970s, is beginning to mess up the accuracy of this radiocarbon dating. Fossil fuels are so old that they do not contain any trace of 14C, but when they burn up they flood the atmosphere with more 12C. Heather Graven, the atmospheric scientist at the Imperial College London, says he was surprised to find how much the emissions could “age” the atmosphere. Radiocarbon dating could become significantly affected by 2020, if current emission trends continue. “If we reduce emissions rapidly we might stay around a carbon age of 100 years in the atmosphere but if we strongly increase emissions we could get to an age of 1,000 years by 2050 and around 2,000 years by 2100,” Graven said. Of course, there might be a way to account for these changes. 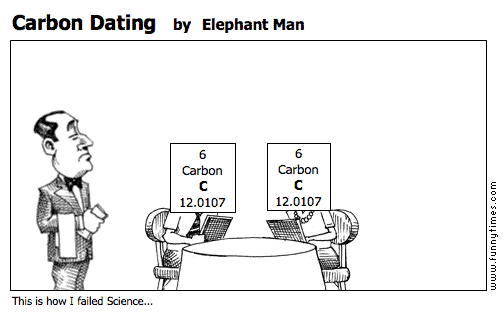 If radiocarbon dating is to remain effective, the technique needs to be adjusted. After all, it would be quite the setback.